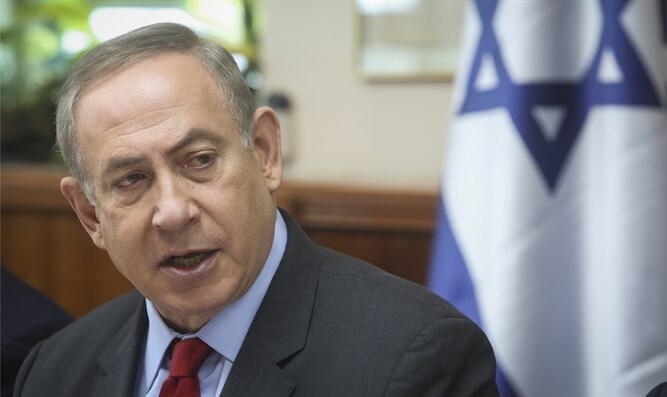 Netanyahu responds to airstrikes in Syria, stresses that Israel has a very clear policy. Israel will continue to act to prevent the transfer of weapons to Hezbollah, Prime Minister Binyamin Netanyahu stressed on Friday. Netanyahu’s statement was a response to Israel’s airstrikes on Syria overnight Thursday. “Our policy is very consistent: when we identify attempts to transfer advanced weapons to Hezbollah, and we have the intelligence and operational feasibility - we work to prevent this," the Prime Minister said. "That's how it’s been and that’s how it will be, we have determination, and the proof is that we are acting, and everyone has to take this into account," he added. Syria responded to the Israeli airstrikes by launching several anti-aircraft missiles towards the Israeli aircraft. Residents of the Jordan Valley, Jerusalem and Samaria reported hearing sirens and explosions as a result of the operation, but the IDF stressed that at no time were the soldiers or Israeli citizens in danger. Syria reacted angrily to the Israeli airstrike on Friday and threatened to respond harshly. "This flagrant attack is part of the Zionist enemy's persistent efforts to support the terrorist gangs of ISIS," the Syrian army said. "It will be responded to directly with all possible means," it added.